Tyronickah placed in the New York finals on April 12th and advances to the National Finals on May 9th at the August Wilson Theatre. She is a junior at Brooklyn Theatre Arts High School. The monologue she did was from Act 2, Scene 4 of King Hedley II. The story is at the point where one main character, Elmore, is putting continuous pressure on Ruby, Kings mother, to tell King about what really happened and about who Leroy Slater is. Finally and with much hesitation she gives in, giving King a vivid almost completely detailed account of what happened when the police came to her and asked her to identify a body with almost no face. The Gruesome recollection of this horrid memory sends Ruby into a seemingly disturbed state as she recalls to her Fiancée and her almost thirty something year old son. COME AND SUPPORT YOUR FELLOW IMPACT BROADWAY MEMBER at the National Finals at the August Wilson Theatre on Broadway on Monday May 9th. Details will follow. “The Start of Dreams”, produced by Jennifer Gordon and directed by The Horne Brothers. “The Start of Dreams” is the story of award-winning director Kenny Leon bringing aspiring teenage actors to a Broadway stage in his annual August Wilson Monologue competition. In a new age where Arts Education is considered expendable in such a declining economy, Leon is determined to use his celebrity and influence to expose kids across the country to the wonderful world of theatre. Featuring A-list actors like Denzel Washington, Samuel L. Jackson and Phylicia Rashad, “The Start of Dreams” is packed with Hollywood’s elite weighing in on this important art form and what it means to humanity. August Wilson’s Century Cycle is an achievement in American theatre. Each of the ten plays are set in a different decade of the twentieth century. At the core of each work are soaring, lyrical monologues that take the song, laughter, pain, and rich content of African American life and place it in the mouths of a great and varied ensemble of characters. The competition is open to sophomores, juniors and seniors from participating cities. The winners at the regional level will travel to the August Wilson Theatre on Broadway to participate in a weekend devoted to Wilson and the final round of the competition. 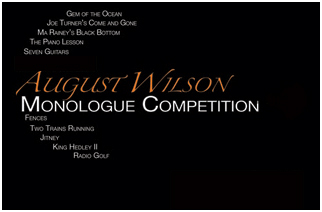 Students will perform a one to two minute monologue from any of the plays in August Wilson’s Century Cycle. 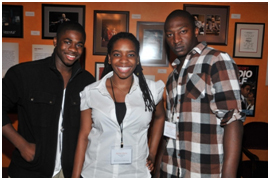 The panel of judges will be comprised of theatre professionals from the respective communities. The winner will receive a $500 scholarship, runner-up a $250 scholarship and a $100 scholarship for honorable mention. All finalists will receive a hardbound book of August Wilson’s plays.